At one time, both the elementary and high schools were administered by one school district. In 1918, the State legislature passed a bill establishing high school districts throughout the State of Illinois. 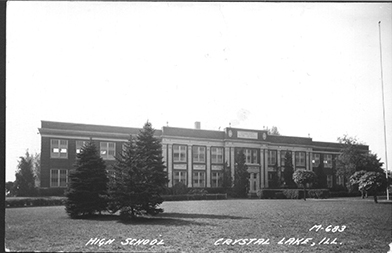 The Crystal Lake Community High School District 155 was established in 1919. The old Crystal Lake School District 47 continued to run the grade schools. The first Board of Education for District 155 consisted of A.H. Hale, W.J. Kittle, L.R. Lippold, Charles T. Allen and Lynn T. Richards as president. Although two separate school districts were established with two separate boards of education, the superintendent for both districts was the same person, H.A. Dean. Mr. Dean held this dual position from 1919 until his sudden death in 1936. Thereafter, each district had its own superintendent. 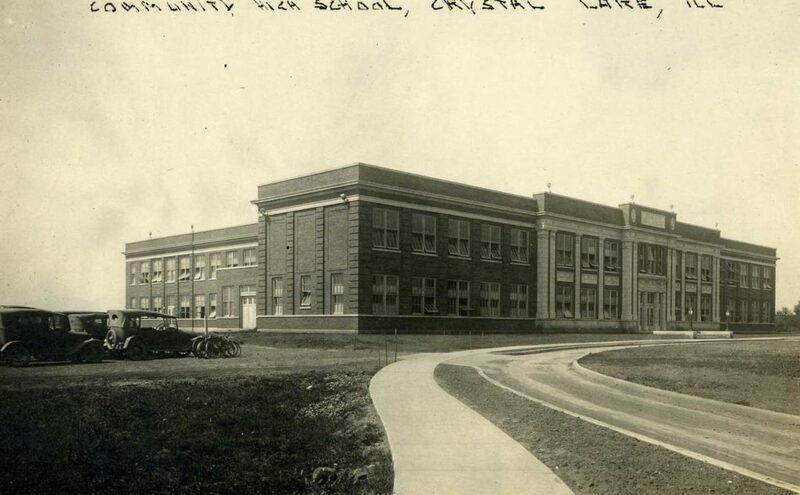 In 1921, the Crystal Lake community authorized the purchase of property for and construction of a high school. In February of 1922, the site on Franklin Street was selected and a bond issue of $195,000 was authorized by an election. Construction of the new high school began in 1923, and the school opened in May, 1924. This was also the month when the high school band made its first public appearance in uniforms. Construction costs for the new building exceeded $300,000. D.M. Ewing was the first school principal in the new building. In 1924, Mrs. A.G. Wilmington, the first school nurse, was employed. In 1928, the athletic teams began to use the nickname of “Tigers” although “Orange and Black” or “Lakers” were continued to be used. By 1929, the school needed an addition, which had been anticipated in the architect’s original plans. A $72,000 addition was added. The football field and running track were added in 1934. Also that year, the entire school was surrounded with cyclone fence. The football field is named for former coach and athletic director, Owen Metcalf. Mr. Metcalf began his career at Crystal Lake Community High School in 1925 and spent 40 years at the school. After two decades of no facility growth, voters agreed to construct a much-needed addition to the high school. The bond issue of $1,430,000 which financed the construction was the largest ever in the county up until then. The addition included the fieldhouse and nearly doubled the number of classrooms available. Much of the eastern wing of the school was completed at this time. Today, Crystal Lake Community High School is known as Crystal Lake Central High School. Due to the increase in population, two additional high schools have been built in Crystal Lake.